Mitchell Stevenson wades through the flooded street on his way to his submerged home on Edgemere Terrace in Roscoe. Stevenson and two dozen families live along the Rock River and see flood waters nearly every spring in their neighborhood. 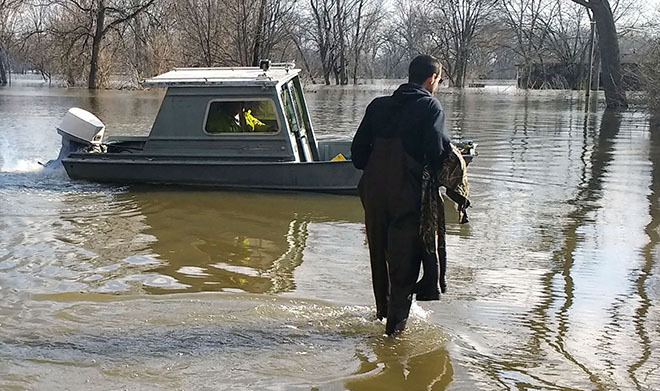 Mitchell Stevenson pulled on his waders and stepped into the cold water in the flooded neighborhood of Edgemere Terrace on Monday afternoon, March 18. The water level was at 14 ft, 4 inches, a record for an area that has consistently seen spring flooding for many years. There are about two dozen homes in the close- knit neighborhood south of Hononegah Rd. in Roscoe. Neighbors look out for each another and are prepared for the flooding Brightly colored canoes and kayaks are stacked on the hillside near the water’s edge, providing transportation for those who have no other options to getting in and out of the neighborhood. Shayla DeBerry paddled a canoe across the water to do some grocery shopping. She and her boyfriend Mark Bee have four feet of water in their basement. They still have power and water, but are without gas or a furnace. Some residents refuse to leave their homes. DeBerry and Bee like living in the area and plan to stay. “The flooding is something we have to put up with,” DeBerry said. Hononegah High School freshman Kennedy Thompson and her pit bull terrier Toews made their way through the floodwaters. She and her family have been lucky so far, their home has stayed dry and not seriously affected by the rising water. Melting snow and heavy rain, couple with frozen ground contributed to the flooding. The Rock River was expected to crest early Tuesday and water levels to begin going down.